The schematic plot of VP and VS anomaly caused by thermal anomaly under spin transition of iron in ferropericalse. Image courtesy Science China Press. The composition and temperature of the Earth's interior are fundamental for us to understand the Earth' interior and his dynamics. Because of the impossibility to access directly most areas of the Earth's interior, the combination of the elasticity of minerals at high temperature and pressure (PT) and the seismic results becomes one of most practical ways to constrain the temperature and chemical composition of Earth's interior. This is done by answering what kinds of aggregates of minerals have the sound velocities and densities of Earth's interior. Therefore the elasticity of minerals at high PT is crucial for us to translate the seismic sound velocity into the composition and temperature. However, obtaining elasticity of minerals at high PT is highly challenging for experimental measurements and extremely expensive using the first-principles calculations. Wu and Wentzcovitch (2011) developed a new method, which reduces the computational loads to one-tenth of the traditional method. The method has been successfully applied to many minerals, whose elastic data are ideal in constraining the composition and temperature and understanding the velocity structure of the lower mantle. Zhongqing Wu and Wenzhong Wang, two scientists at University of Science and Technology of China, review recently the relevant advance. The traditional method requires vibration density of state (DOS) of ~ 100 configurations with various kinds of strains and volumes. By analyzing the relations between volume dependence of and strain dependence of lattice vibration, Wu found how to get the knowledge of strain dependence of lattice vibration needed in calculating the elasticity from the volume dependence of vibration, which avoids the vibration DOS for the configurations under strains. Therefore the numbers of the vibrational DOS need to be calculated is reduced to ~10 from ~100 in the traditional method. It is clear that the computational and manual loads of the new method are only less than tenth of the traditional method. The elastic data show that the new method has the comparable precise as the traditional method. The effect of spin transition of iron on the properties of ferropericalse has been conducted extensively in the last decade. Taking advantage of the new method, Wu et al for the first time obtained the elastic data of ferropericlase and found that the spin transition can produce some visible features in seismic tomography and some reported seismic tomography results show the features in consistence with the spin crossover. The works open the possibility to take advantage directly of the spin crossover to promote our understanding to the lower mantle. 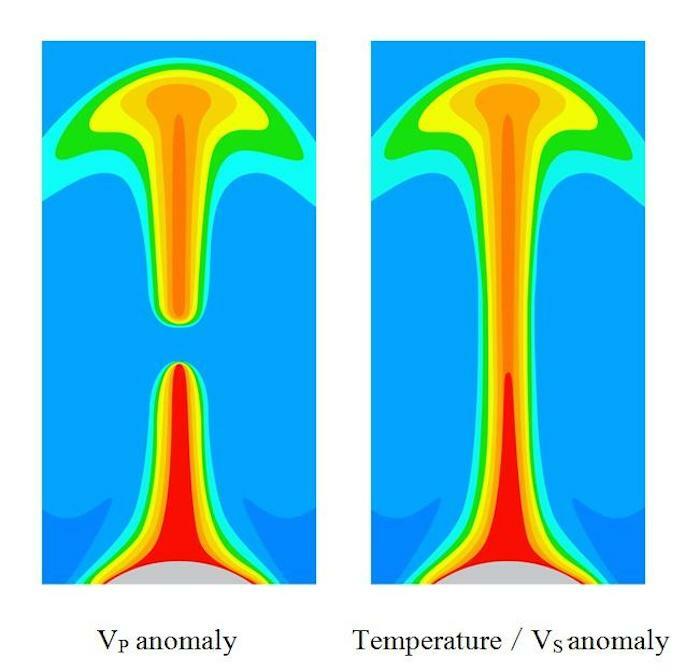 In general, the bulk modulus of the materials decreases slowly with increasing temperature. The spin transition leads to an unusual effect that the bulk modulus of ferropericlase increases quickly with increasing temperature at certain temperature range. The effect is so significant that the bulk modulus of the lower mantle can increase with increasing temperature at some depths even the lower mantle has only ~15 wt% Fp. Therefore the temperature effect of the bulk modulus and of the shear modulus of the lower mantle cancels out each other and VP of the lower mantle become insensitive to the temperature at certain range of the depths (~1750 km). VP anomaly caused by thermal anomaly should be much smaller at the depth of ~1750 km than those at the adjoined depths, namely, the structure of VP looks like have a disruption. Geodynamic simulation show that spin transition play a critical role for structure feature of the large low shear velocity provinces in the lower mantle because of anomalous effect of spin transition on the thermodynamic properties of ferropericalse. Therefore the spin transition of iron in ferropericalse in the lower mantle has been suggested by three main branches of geophysics: mineral physics, seismology and geodynamics. Using the obtained elastic data, Wu constrained the composition of the lower mantle and show that the content of Fp locates between the pyrolite and chondritic model, two main composition models of the mantle and any composition well constrained by seismic model has a sufficient amount of ferropericalse to show the positive temperature dependence of the bulk sound velocity but is not sufficient to exhibit the positive temperature dependence of the compressional wave velocity at the middle lower mantle. Anticorrelation between the bulk sound velocity and the shear velocity without involving any composition variation is a robust feature at the middle lower mantle.